COVENS - Carte des Isles de Maiorque Minorque et Yvice dediée A.M. le Comte de Maurepas Ministre et secretaire d'Etat. . .
COVENS, J. / MORTIER, C. - Carte des Isles de Maiorque Minorque et Yvice dediée A.M. le Comte de Maurepas Ministre et secretaire d'Etat. 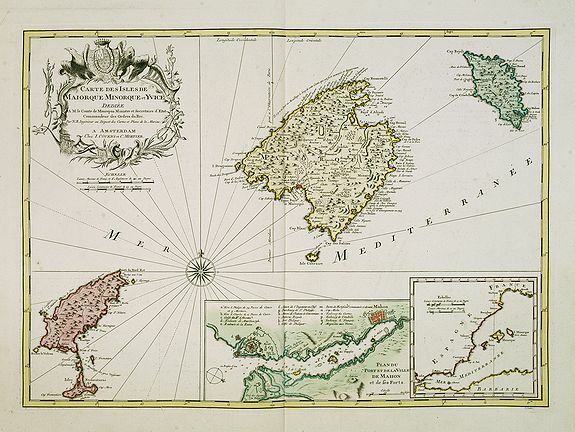 . .
Carte des Isles de Maiorque Minorque et Yvice dediée A.M. le Comte de Maurepas Ministre et secretaire d'Etat. . . - COVENS, J. / MORTIER, C.
Title : Carte des Isles de Maiorque Minorque et Yvice dediée A.M. le Comte de Maurepas Ministre et secretaire d'Etat. . .. Date : Amsterdam, after 1740. Size : 15.9 x 22.0 inches. / 40.5 x 56.0 cm. Description :Fine map of the Baleares with much detail, in lower part inset "Plan du Port de Mahon du Fort St. Philippe et ses Fortifications". The map is dedicated to Jean Frédéric Phélypeaux, Comte de Maurepas (1701-1781) who held the position of Secretary to the Royal Household and Minister of Marine in the court of Louis XV. He succeeded his father as State Secretary at age fourteen, and thereafter became one of the most powerful nobles at the French court. He maintained this power until 1749, when he was accused of writing derogatory epigrams about Madame de Pompadour, the King's mistress. He was then banished from court until 1774, when he was recalled by Louis XVI and established as one of the King's councilors. A large presentation of Ibiza lower left. Jean (Johannes) Covens and Corneille (Cornelius) Mortier were brothers-in-law, who carried on the book publishing business established by Pierre Mortier in Amsterdam in 1685. Pierre Mortier's company owed much of its success to his access to French publishers, whose publications he re-issued in handsome editions. The elder Mortier died in 1711, his wife continued the firm until she died in 1719. In 1721, Covens and Mortier formed a partnership, Covens having married Agatha Mortier in the same year. They continued the business by publishing enlarged editions of Sanson, Jaillot, and De L'Isle, as well as some of the later Dutch cartographic masters such as De Wit and Allard, and of course Pierre Mortier.